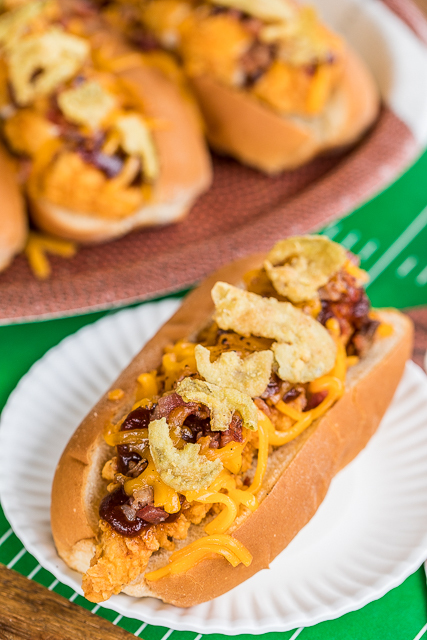 BBQ Bird Dogs - chicken fingers, bacon, cheese, BBQ sauce and fried jalapeños - perfect tailgating food! Easy to assemble in the parking lot! We also love to eat these for a quick lunch or dinner. Happy Thanksgiving!!! I hope you are having a wonderful holiday full of lots of amazing food!! This is a big holiday week, and it is also a big football week. It's rivalry week!! Most importantly in my world, it is Iron Bowl week. The Iron Bowl is a fancy name for the Auburn - Alabama game. It is THE game here in the state of Alabama. We will be heading down to Auburn for the game tomorrow. I will be bringing all the stuff the make these yummy BBQ Bird Dogs! Have you heard of bird dogs? No? Well, a bird dog is like a hot dog but you use chicken tenders instead of hot dogs. Chicken = Bird, so Bird Dogs. 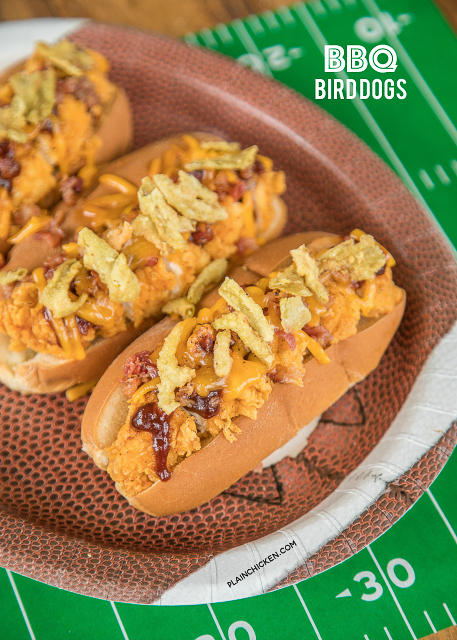 These BBQ Bird Dogs are PERFECT for tailgating in the parking lot. You can assemble them on-site with ease! Here is a play-by-play for you. I use a kitchen torch to melt the cheese when I am not at home. It works great! If you are at home you can pop the BBQ Bird Dogs in the oven for a few minutes or under the broiler. We LOVE these BBQ Bird Dogs. We top them with some fried jalapeños for a kick. If you don't like fried jalapeños, you can swap them out for some french fried onions. 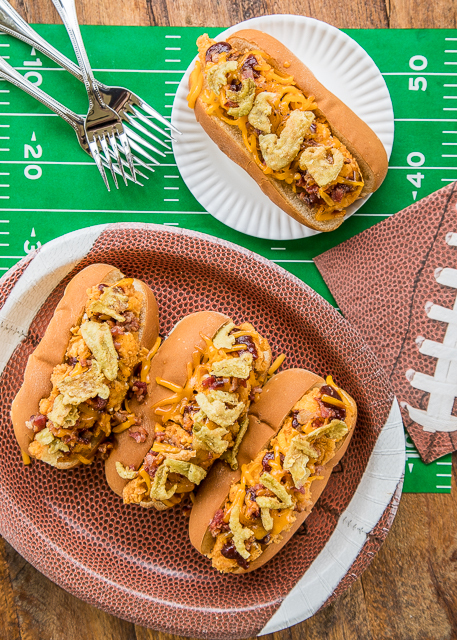 Either way, these are sure to score a touchdown at your tailgate this weekend! 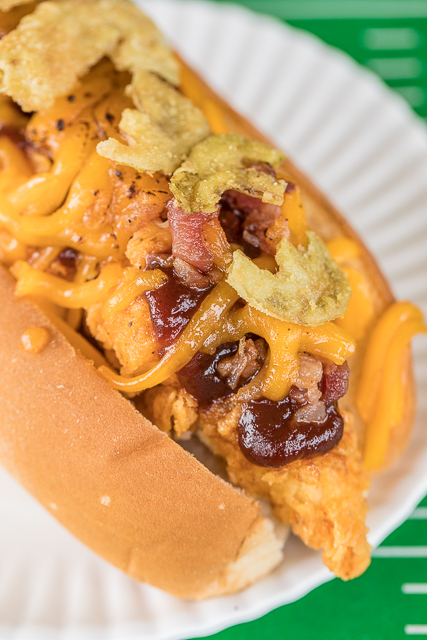 For each Bird Dog: Chop chicken finger and place in hot dog bun. Top with one slice of bacon, crumbled. Top bacon and chicken with 2 Tbsp cheese. Melt the cheese with kitchen blow torch (http://amzn.to/2zsZNMC) or under the oven broiler. Top with 1 Tbsp BBQ sauce and 1 Tbsp fried jalapeños. Great idea and delicious sounding recipe. It should be a great game on Sat. It should be a heck of a game Saturday! I would have never believed it at the beginning of the season. Auburn has really come a long way. Fingers crossed!! !